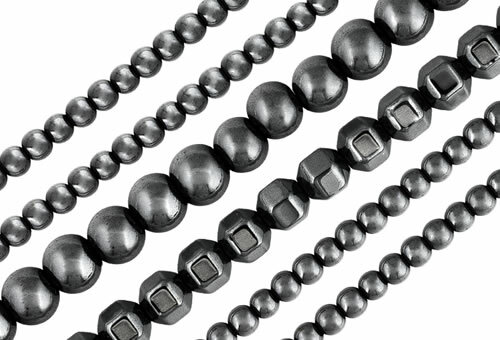 Hematite is a dark gray to black mineral known to various cultures throughout history. Babylonians, Egyptians, Greeks, and Romans were a few of the civilizations that made use of this mineral. Hematite derives its name from a Greek word for blood, an allusion to the reddish powder produced during the fashioning process due to the presence of iron. Appearance, fracture and SG. Hematite is only slightly magnetic whereas synthetic hematine is moderately magnetic. Misnomers: black diamond, black pearl and Alaskan black diamond. Hematite will have a reddish color in surface fractures. Intaglios will show engraver marks.